I love so so so much the details of a wedding. The details are where you can see the personality and passions of the bride, groom and their families. Through the details you get to see their creative eye come to life! Each of our weddings have so many adorable and fun filled wedding details that I could have posted 100’s of photos of each of them however I do not think that WordPress or Jonathan would appreciate this. Therefore here are just a few that stand out to me. Some are decor details and some are idea details. Adkins Wedding: Here is a guest’s gift along with a seating chart. Honey dippers tied to guest’s name and table. Brilliantly cute! Behm Wedding: Passionately Pink Wedding Shoes! Being a fan of pink I absolutely adore these hot pink shoes! 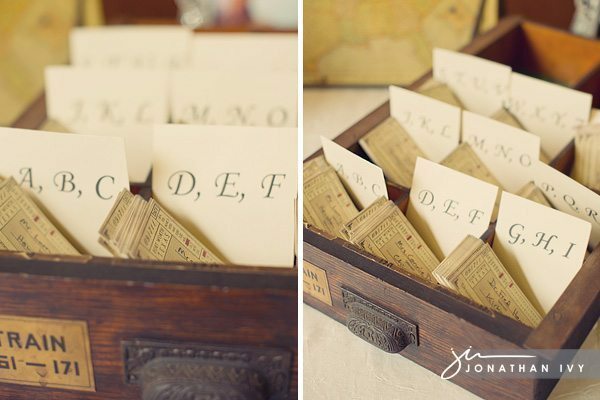 Rustic Wedding: Using books to create table numbers & mason jars for floral arrangements…Swoon! Parmerlee Wedding: all of the bride’s bridesmaids signed the bottom of her shoes! So cute! Ramirez Wedding: oh how I love beautifully designed wedding rings like this one. So delicate and gorgeous! Tower Wedding: the little boxes shown above are boxes that the ring bearers carried down the aisle so of course we took a picture of the rings on them= GORGEOUS! Tower Wedding: Speaking of gorgeous, this bride also wore my favorite shoes of 2011. Stunning Badgley Mischkas! Tower Wedding: And the photo immediately above are the seating cards on vintage train tickets= Super Creative Detail. Tower Wedding: this might be my favorite detail of the entire year…the guest’s invitations printed on handkerchiefs! What a unique invitation idea! Valderas Wedding: fruit & flower centerpieces. Aren’t the colors beautiful? Brigati Wedding: having a unique photo booth set up. This booth was packed like this all night long! So many cute photos were taken as laughter radiated throughout the night! Carle Wedding: Are you catching a theme yet? We LOVE old cars! They are such a great touch to a wedding! Something to enjoy outside the norm and something we love to take photos of. Carle Wedding: Unique guest’s gifts…signs with their names on them. Also doubles as cute decor as shown here wrapped around the bar! Cherian Wedding: bridesmaids all wearing different shoes. Added bonus, the bride wore shoes that matched their dresses. LOVE! Hearn Wedding: another bride putting her creative juices into play. During cocktail hour the guest could grab a bag of peanuts to enjoy! Cute & yummy! Krause Wedding: Looking for an extreme exit? Try silly sting like our couple above did…yes there is a bride and groom in there somewhere! Very well done. The detail shots are wonderful.